When anti-tumour therapy is administered to a tumour-host environment, an asymptotic tapering extremity of the tumour cell distribution is noticed. This extremity harbors a small number of residual tumour cells that later lead to secondary malignances. Thus, a method is needed that would enable the malignant population to be completely eliminated within a desired time-frame, negating the possibility of recurrence and drug-induced toxicity. In this study, we delineate a computational procedure using the inverse input-reconstruction approach to calculate the unknown drug stimulus input, when one desires a known output tissue-response (full tumour cell elimination, no excess toxicity). 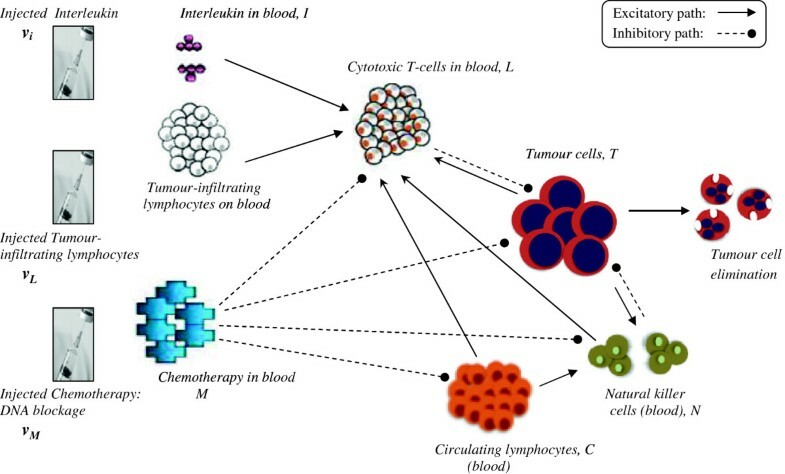 The asymptotic extremity is taken care of using a bias shift of tumour-cell distribution and guided control of drug administration, with toxicity limits enforced, during mutually-synchronized chemotherapy (as Temozolomide) and immunotherapy (Interleukin-2 and Cytotoxic T-lymphocyte). Quantitative modeling is done using representative characteristics of rapidly and slowly-growing tumours. Both were fully eliminated within 2 months with checks for recurrence and toxicity over a two-year time-line. The dose-time profile of the therapeutic agents has similar features across tumours: biphasic (lymphocytes), monophasic (chemotherapy) and stationary (interleukin), with terminal pulses of the three agents together ensuring elimination of all malignant cells. The model is then justified with clinical case studies and animal models of different neurooncological tumours like glioma, meningioma and glioblastoma. The conflicting oncological objectives of tumour-cell extinction and host protection can be simultaneously accommodated using the techniques of drug input reconstruction by enforcing a bias shift and guided control over the drug dose-time profile. For translational applicability, the procedure can be adapted to accommodate varying patient parameters, and for corrective clinical monitoring, to implement full tumour extinction, while maintaining the health profile of the patient. Though there has been considerable efforts in exploring newer modalities of cancer treatment in the last several decades, hopes have been belied by a fundamental reason, though not fully appreciated, namely the difficulty of eradicating a tumour mass due to the nature of reaction kinetics that govern the interaction of tumour cells with the therapeutic agents administered. These interactions are governed by first-order reaction processes (chemotherapy) and enzyme saturation kinetics (immunotherapy) . Both these prescribed treatments cause an exponential decay of the tumour cell population leaving a finite definitive number of tumour cells at the asymptotic extremity of tumour versus drug distribution curve. By its very nature, an asymptotic tail implies the tumour cell population curve will contact the horizontal axis and become zero only when either the time duration or the drug dose is infinite. For instance, a typical tumour may have 1010 cells, and the surviving fraction, SF, of tumour cells after administration of a drug concentration D is SF = exp (−α D). Using the standard values of α = 0.02 and D = 150 mg for bleomycin (maximum dose tolerated) , the equation yields 1,765 cells surviving. This elucidates why many tumours recur, after appearing to initially shrink or regress under therapy. An imminent question in neurooncology is the efficacy of the drug to be able to cross the “blood–brain barrier” (BBB) to enter the brain. A recent progress is the development of DNA alkylating drugs such as Temozolomide (TMZ) which while being highly targeted, can effectively cross the BBB . However TMZ is known to be contraindicated in some cases such as in patients with severe myelosuppression. A few other common side effects are nausea and vomiting which are self-limiting or readily controlled with standard therapy. Temozolomide is a teratogenic compound and thus should not be used during pregnancy. It might very rarely leads to acute respiratory failure. However, no drug-related adverse CNS effects or alopecia are known to occur with temozolomide . To complement the effects of chemotherapy, immunotherapy, is also being considered for its synergistic carcinolytic effects. Recent incisive findings of Wheeler et al. indicate that a combinatorial therapy design utilizing immunotherapy with chemotherapy reduces tumour volume by 50% and appreciably extends the average 1 year survival duration of glioblastoma patients, which cannot be done by either chemotherapy or immunotherapy alone. An important aspect of immunotherapy is to utilize cytotoxic T-lymphocytes (CTL) which are CD8 + T cells, that are known to be carcinolytic. Activated CTL can be generated by administering immunomodulating factors,. This can be done by two means: (i) administering cytokines such as Interleukin-2 (IL-2) which can cross the blood–brain barrier, and (ii) injecting cellular agents such as tumour-infiltrating lymphocytes (TIL) prepared beforehand by sensitizing T-cells of the patient’s blood against the tumour (biopsy tissue). These TILs proceed satisfactorily to the tumour mass in the brain parenchyma. Also, IL-2 is well known to stimulate recruitment and proliferation of cytotoxic T-lymphocytes, such as CD8+ T cells, suggesting a novel neurooncological approach . Here u 1 , u 2 , …. are the levels of the different antitumour agents, while B 1 , B 2 , …. are the weighting factors of the different agents. We use this principle to suitably orchestrate the temporal schedule of the drugs, so that that toxicity is minimized. We may mention that various attempts at modeling the immune system interaction with neoplastic tumours have been previously made [8–10]. These models have efficiently characterized the computational dynamics of drug versus tumour interaction via the immune system. Using the background of the existing models, in our model we have tried to delineate the kinetics and dynamics of immune modulation responsible for the paradoxical clinical phenomenon of tumour dormancy, prolonged arrest and oscillations of tumour-size . A unitary approach to the dual behaviour of tumour progression and tumour regression has recently been explained , where the neoplastic process has been elucidated as systems biology-based abnormality. The tumour regression approach that we report in the present work is to our knowledge, the first endeavor to elucidate a quantitative methodology to delineate the dose-time profile of administration of the antitumour agents (chemotherapy, interleukin, lymphocytes) with neuroncological cases as examples, so as to enforce the tumour cell population to zero, thus enabling full tumour elimination. For this, we develop an interdisciplinary approach, utilizing input reconstruction analysis and bias shift. Typically, in eq. 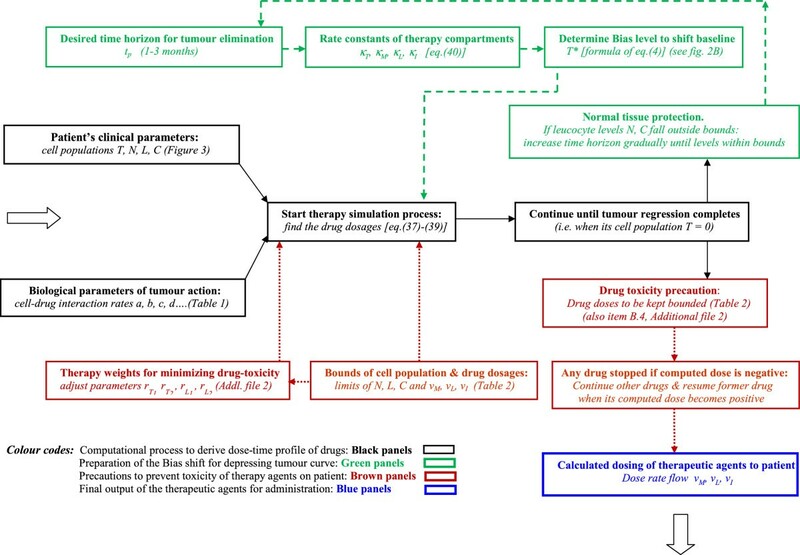 (1), the investigator starts with varying dosages of the drug combinations D N , and obtains the resulting values of the surviving tumour cell population T as one changes the dosage profiles of the drugs. Using this information, the specific dosing schedule of the drugs, D N † is selected, which would lead to minimization of the number of remaining cancer cells, T min . The sites X, Y and Z are referred respectively as intrinsic (input), intermediate and extrinsic (output) compartments (Figure 1). The extrinsic compartment Z is related to the external output of the therapy system (i.e. remnant tumour cell population T). Likewise, the intrinsic compartment X relates to the internal control input coming from the therapy system, i.e., administration of therapeutic agents, D N .
Functional design of the therapeutic system using the Stimulus-Reconstruction approach. Output compartment (Tumour cell compartment): The state T (tumour cell population) is driven by state L (cytotoxic T-cell population in blood) and state M (chemotherapy drug temozolomide concentration in blood). Goal of system design is that the tumour cell population in this compartment decrease to a desired definitive value T d (which is aimed to be zero); solving this compartment we arrive at L* and M* which are desired values respectively for cytotoxic T-cell population in blood and temozolomide concentration in blood required for complete tumour elimination. Intermediate compartment (Cytotoxic T-cell compartment): State L (cytotoxic T-cell population in blood) is driven by state I (interleukin-2 concentration in blood) and by state v L (daily dosage of tumour-infiltrating leucocyte injection as immunotherapy). Solving this compartment, we get I* and vL* which are the desired values respectively of interleukin-2 concentration in blood and dosage of tumour-infiltrating leucocyte required for tumour elimination. Input compartment-I (Interleukin-2 injection compartment): State I (Interleukin-2 concentration in blood) is driven by state vI (daily dosage of interleukin-2 injection as immunotherapy). By solving this compartment, we arrive at vI*, the desired value of interleukin-2 dosage required. Input compartment-II (Temozolomide injection compartment): State M (temozolomide concentration in blood) is driven by state vM (daily dosage of temozolomide injection as chemotherapy). Solving this compartment, we arrive at vM*, the desired value of temozolomide dosage required. Input compartment-III (Tumour-infiltrating leucocyte injection compartment): This furnishes daily dosage of tumour infiltrating leucocyte injection required, and is constructed from cytotoxic T-cell compartment above. Collateral compartment (normal tissue protection): This compartment comprises of circulating lymphocytes concentration in blood (C) and natural killer cell concentration in blood (N) which guard normal tissue against infection that may be caused by toxicity side-effect induced by the therapeutic agents. So, in the equation (2), one puts T = 0 at time t 1 , which is used to calculate the temporal profile of dosages of the combination drugs (DN†). Thus, if one administers the temporal dosages profile (DN†), then the tumour cell population definitively becomes zero in time t 1 , indicating tumour elimination. The perspective of inverse analysis approach [eq. (2)] has been well used in other fields in the form of stimulus reconstruction approach. This enables one to accurately quantify an antecedent unknown stimulus, using the knowledge of the observed response pattern. In our case, the methodology enables one to reconstruct the input drug stimulus, which will accurately produce complete tumour elimination as the output in finite time. where T 0 is initial population, T′ is the time derivative of T, and κ T is the drug’s cytotoxic rate constant (Figure 2A). As explained before, there persists asymptotically a residual tumour cell population, which now needs to be dealt with. 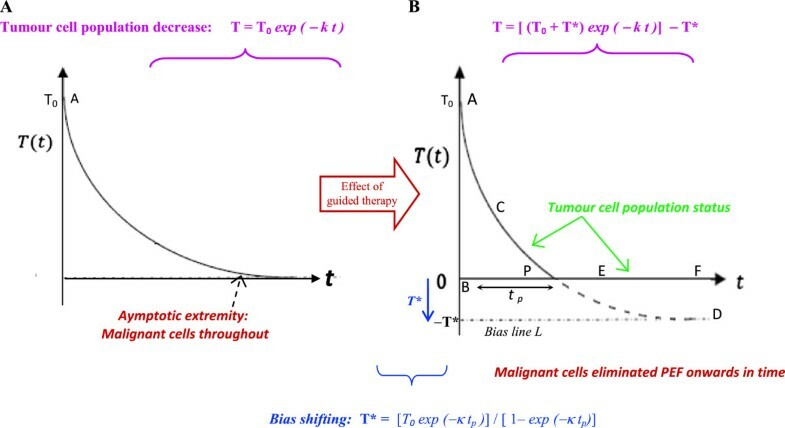 Hence, one needs a procedure to ensure that the monotonically decreasing curve contacts the horizontal axis at a definite finite time point t p . In other words, the cell population curve should be dynamically modulated by therapy so that its trajectory is actively guided, enabling the curve to contact the horizontal axis at time t p .
Implementation of Bias Shift in tumour cell population trajectory to ensure complete elimination of tumour. (A) Under usual intervention by therapeutic agents, the elimination of the tumour cell population T(t) is an exponentially decreasing curve, asymptotically approaching the time axis, so that tumour cell population becomes zero at infinite time duration. There is always a number of malignant cells in the exponential tail of the curve at any realistic time point, and the tumour recurs after the therapeutic agents are stopped. (B) The procedure from control systems analysis of utilizing the methodology of Bias Shift, for enabling the tumour cell population curve under therapy, so as to definitively attain zero cell population (tumour extinction) within a specific time t p . The curve of T(t) intersects the time axis i.e., T(t) = 0, at the definitive time point P, by incorporating bias shift using a finite T* value. As in the case of a biochemical reactor, conditions may arise where the synthesis rate R following first-order reaction, needs to be controlled and stopped at a definitive time . To explore the possibility of inducing the reactor's processing to stop (i.e., R = 0), one may omit the input feed of reactants which causes the reaction to slow, but not become zero even after any length of time leaving a small asymptotic level of reaction rate R persisting at a time t, since first-order kinetics indicates R′ + κ R = 0. The asymptoticity in both the above cases is due to the fact that both the dynamic equations are similar and first-order, viz. y′ + k y = 0. Here the y-axis denotes the system parameter, as reaction rate or altitude, while the x-axis denotes time. The equation implies that at infinite time, the curve meets the y-axis, if the coordinates at this meeting point is t † and y † , then y † = 0, as t † = ∞. Nevertheless, in the exponential systems above, we elucidate that the systems dynamics can be halted in a finite time (i.e., y = 0, at specific time t p ), if one implements the concept of an adjustable or tunable bias shift, denoted by y*. This enables the performance curve to approach a value y → y* (a proposed pre-determined negative value), as t → ∞ [Figure 2B]. This ensures that the curve trajectory intersects the time axis, and has an exact value y = 0 robustly, at a definite time t p [point P, in Figure 2B]. We have earlier methodologically simulated and validated realistically the procedure of bias shift, while respecting the requisite bounds or constraints imposed on the system ; thereby the exponential curve was induced to become zero within specific time interval, the error in the validation process being within 2.5%. The aim of control systems design is to enable the tumour cell population (state T) to track and approach the T* value i.e. T → T*, where T* has a chosen bias shift whose value depends on the desired duration of tumour elimination, t p . From Figure 2B, the curve T is the arc path ACPD. Eq. (6) is the condition for complete tumour regression, and hence should be followed by the tumour cell compartment in Figure 1. Thereafter, proceeding upwards through the successive compartments, such as administration of chemotherapy then the immunotherapy, we can obtain the dose-time profiles of temozolomide, interleukin-2 and tumour-infiltrating lymphocyte injections, for regression of the tumour within the time duration t d . Thereafter, the tumour shall not recur as there are no surviving tumour cells. As a precaution, we continue the therapies for an extra sufficiently long period before fully stopping. We have earlier used the inverse solution approach, but without bias shifting, for two treatment scenarios: (i) controlling chemotherapy infusion (imatinib) in myeloid leukemia , and (ii) regulating therapeutic infusion for treatment of ionic metabolic or hypocalceamic imbalance (control target error < 5%) . In these cases the tumour cell population regressed and the blood ionic level tended to approach the desired value with high stability and asymptotically, but complete tumour elimination could not be obtained at a definitive time. In the present paper, we have remedied this problem by using adjustable bias shifting. 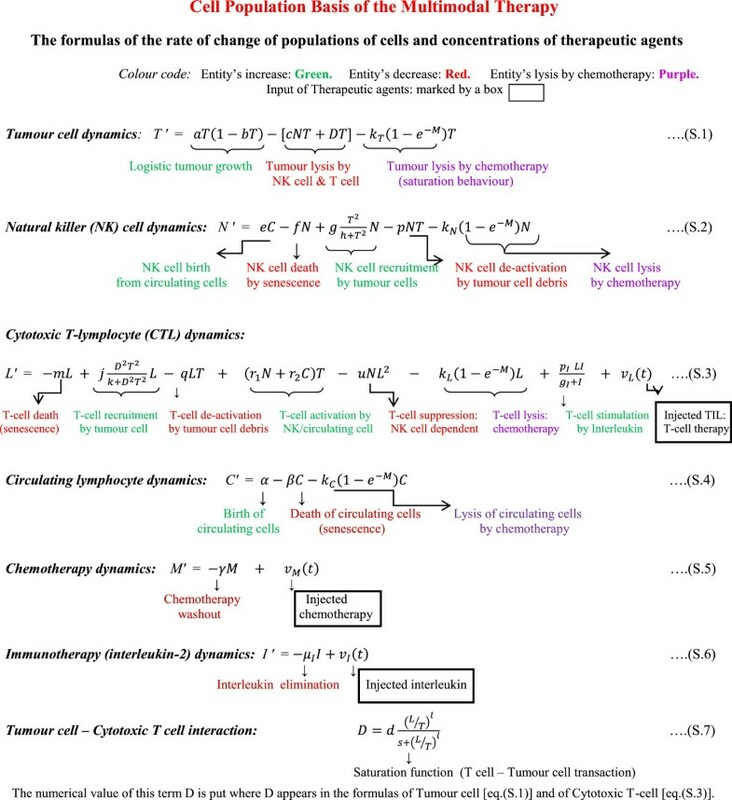 We elucidate the quantitative approach for tumour dynamics under combinational chemotherapy and immunotherapy (Figure 3), based on coupled ordinary differential equations (ODE) between various cells and therapeutic agents. The approach is a broad one, and can be generalized to common situations. In the current instance, we take the case involving tumour cells, innate immunity cells (Natural killer cells), acquired immunity cells (Cytotoxic T-cells), and normal tissue protective cells (Circulating lymphocytes), along with antitumour therapies, including chemotherapy in the form of TMZ, and immunotherapy, namely externally administered lymphocytes (tumour-infiltrating lymphocytes) and lymphocyte-activating agents (as IL-2). The equations recollect the experimentally-based immunological reaction-rate framework demarcated by de Pillis et al., Kuznetsov et al. and Kirschner et al., which has also been empirically validated . The formulation also utilizes findings from animal studies and human clinical trials and uses models employed in cellular population biology, incorporating reaction kinetics such as Michaelis-Menten type of interaction and saturation processes as logistic functions. Interaction of multimodal therapy on the tumour and host system. Pointed and rounded arrows denote the major facilitatory and inhibitory interactions respectively. Chemotherapy inhibits the various cells, tumour cells being more susceptible. The major interactions are shown, and the minor ones are mentioned in the text. 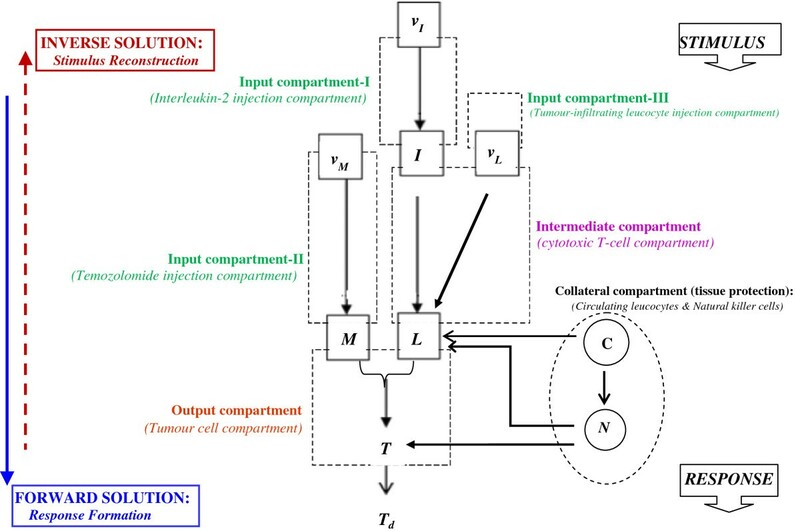 All the cell-cell interactions, rate equations with temporal dynamics of the proposed model are graphically summarized in Figure 4 [eq. (S.1) to eq. (S.7) therein], and these are elucidated in Additional file 1: Supporting Methods. In the formulas, the primed symbols denote the temporal derivatives of the above entities (populations of the four types of cells, or concentration of three therapeutic agents). The numerical values of the constant parameters are obtained from experimental or clinical studies; values are given in Table 1. Quantitative Formulation of the Multimodal Therapy. Temporal lysis parameters of different cells: k T , k N , k L , k C .
v M (t), v I (t), v L (t) are the daily injected dosages (input rate per day) of chemotherapy (temozolomide), immunotherapy (interleukin-2), and cytotherapy (TIL cells) respectively. This equation implies that there is a definitive tumour-free stationary state. At this equilibrium point there is no presence of any malignant cell, i.e., the cytotoxic T-cell population TE = 0, LE = 0, while there are specific levels of the immune cells, NK cells and circulating lymphocytes, that correlate with the healthy state (NE = eα/βf, CE = α/β). Substituting the values of the parameters α, β, e and f from Table 1 and taking the average blood volume of 6 liters for an adult, we arrive at the natural killer cell equilibrium population = 430,000 cells for the whole subject and circulating lymphocytes population = 72 billion for the same. It is this equilibrium state that the system tends to settle to, in the occasion of successful therapy. System state variables are the parameters indicating the internal biological condition of host-tumour interaction in the patient. The system state variables in this case are (1) Tumour cells (T), (2) Natural killer cells (N), (3) Circulating lymphocytes (C), (4) Cytotoxic T-Lymphocytes (L), as well as (5) blood concentrations of Interleukin (I) and of (6) temozolomide chemotherapy (M) [Figure 1]. The state variables are denoted as functions X n , where n = 1 to 6. Control variables of system include the parameter values the external administrations of the three therapeutic agents, viz. the dose input rates of the injected chemotherapy (temozolomide) and immunomodulants (interleukin-2 and tumour-infiltrating lymphocytes), which are represented by v M (t), v I (t), and v L (t) respectively. These parameters vary with time and are measured in body-weight normalized rate units, e.g. in mg. of a drug per kg of body weight (or, per square metre of body surface) of the patient, given per day. These control variables are denoted as functions U m , where m = 1 to 3. Constraint conditions of system indicate the quantitative requirements or thresholds that cannot be crossed application of the therapy. All the state variables need to be maintained within minimum and maximum values given in Table 2. For instance, the minimum and maximum values of the different cellular parameters should be within the physiological range that is necessary for homeostatic maintenance of the internal environment, or milieu interne of the patient. Too high a value of an entity can be toxic to the system, while, in some cases, there is a minimum value required so that the host can have proper immune surveillance to ward off foreign cells or microorganisms. * This is applicable to the time after the tumour has been eliminated and pertains to population of the effective CD8+ T-cells specifically active against the particular tumour-lesion in the body; after tumour elimination, there is no possibility of stimulation by tumour cells to initiate the generation of the active tumour-specific CTL. The various bound values in the Table can be relaxed by 10-15%, this relaxation in the limits of physiological parameters being accommodated by the homeostatic adaptation of the physiological system . Note: For clarifications of values of the bounds, see endnote a before the references bibliography. Using control systems practice, to construct the rate equation of any one particular state variable X p (a biological parameter), we express its time derivative or rate parameter X p ′, as a function of (i) the values of the various biological parameters that determine the system, namely X n , and (ii) the effect of the proximal causal control variables (drug factors, U m ) on the biological variables (X n ). We shall now explain the construction of the control design, in terms of objective, operation and toxicity-minimization for each compartment. The aim is to find the desired values, M* and L* of this compartment’s input parameters (Temozolomide blood level and Cytotoxic T-cell population), which will drive the compartment’s output (tumour cell population curve T) towards the line T*, until the T value becomes zero at point P in time t P (Figure 2B). the function f T (X n ) which denotes the values of the various biological parameters that determine the tumour cell population system, namely the state parameters X n. This explains the tumour cell alteration function due to two intrinsic biological (non-pharmacological) processes: (a) tumour cell growth term, due to logistic or saturable growth, (b) tumour cell elimination term due to natural killer cells. the functions g T 1 and g T 2 that imply the biological effect of the compartment’s input therapy variables that show a dose–response saturation behavior U r , which is produced by the two antitumour entities, cytotoxic T-cell population L, and temozolomide concentration in blood, M.
Eq. (12) furnishes the relationship of the blood concentration of the antitumour agents (U M and U L ), which, if implemented, will ensure that the tumour cells undergo complete extinction. Eq. (12) furnishes the relationship of the blood concentration of the antitumour agents (U M and U L ), which, if implemented, will ensure the tumour cells undergo complete extinction. Here the goal is to find the desired values, I* and v L *, of this compartment’s input parameters (interleukin-2 blood level and tumour-infiltrating lymphocyte injection dose-rate), which would drive the compartments output, namely the cytotoxic T-cell population, L to its desired value L* mentioned in the last paragraph. This enforced driving needs to be faster than the earlier compartment (tumour cell compartment) and requires to be done till time tr, point P, when all the tumour cells have become eliminated (Figure 2B). Note here that f L (X) is the performance function of the cytotoxic T-cell compartment, a part of the the right-side of the eq. (26) except its last two terms, which are the therapy-input terms, dependent on the interleukin and tumour-infiltrating lymphocyte injected, the two terms being denoted as b L , In eq. (26), the last term vL is the Tumour-infiltrating lymphocyte injection dose-rate, while the second-last term [p I LI/(g I +I)], now denoted as UI, is the therapeutic efficiency relationship of interleukin-2. Evidently from eq. (26), the term b L signifies the total cytotoxic T-cell activation effect by the two immunotherapeutic inputs: the interleukin efficiency term U I and the tumour-infiltrating lymphocyte administration term vL (Table 3). Indeed, the said equation indicates that the relaxation decay term b L has positive value if the tumour regresses (or zero, if the tumour is arrested and thereby stable), i.e. b T ≥ 0. Actually, eq. (29) furnishes the relationship of the characteristics of the antitumour agents, interleukin and tumour infiltrating lymphocytes (UI and vL), which if implemented, will ensure the full elimination of tumour. where rL 1 and rL 2 are the sensitivity weights due to the two aforesaid therapeutic moieties in this compartment. For minimization, the constraint requirement [U I + v L = b L ] from [eq. (29)] should be obeyed. Solving using the Lagrange multiplier method, we arrive at:. Here the goal is to find the desired value, v M *, of this compartment’s input parameter (temozolomide injection dose-rate), which would drive the compartment’s output, namely the patient’s blood level of temozolomide M to its desired value M* as given in eq. (22). This driving needs to be done faster than the preceding compartment (T-cell compartment), and is to be done by time t p , point P (Figure 1). These are rate constants of the tumour cell compartment, temozolomide compartment, cytotoxic T-cell compartment and interleukin compartment, respectively, as regression occurs under the action of multi-modal therapy. These are calculated from the desired rate of tumour regression, expressed as settling time ts of the regression process (the time duration in which 90% of tumour has regressed), and is taken to be around 1–2 months. The tumour regression rate constant κ T = 4/ts; so if ts is 60 days, κT = 0.067 per day. On the other hand, the dynamics of the successively preceding compartments (e.g. chemo-therapy and cytotoxic T-cell compartments) need to be faster, as they causally influence the tumour cell compartment, and thus need to change more rapidly if they are to have a controlling influence on the tumour cell compartment (Figure 1). Thus, the time constants of the modular stages will be lesser, and hence the process rate constant will be higher. So, we can choose the rate constants κ L and κ M of cytotoxic T-cell compartment and temozolomide injection compartment respectively, such that they exceed κ T . Similarly, the rate constant κ I of interleukin compartment (that causally acts on the T-cell compartment), is chosen to be higher that κ L .
In the above example, since, κ T = 0.067/day, we get κ L = 0.201/day, κ M = 0.201/day, and κ I = 0.603/day. It may be noted that the tumour elimination time t p (Figure 2) when 100% tumour has regressed, is longer than ts, and can be selected as 10 days more, i.e. t p = 70 days. If the initial pre-therapy tumour cell population is estimated as T 0 , then substituting the values of T 0 , κ T and t p in the right-sided expression in eq. (4), provides the value of bias shift T*. These adaptable parameters, r T1 , r T2 , r L1 , r L2 are needed for minimizing the toxicity cost of the therapy. It is these parameters that give a control to the investigator for maneuvering the tumour elimination process, under adjustable dosing of the drugs. Initially, the values of the tuning parameters r T1 , r T2 , r L1 , r L2 which appear in derivation, are chosen by specific quantitative conditions (see Additional file 2: Supporting Analysis). To recapitulate, r T1 and r T2 are respectively the toxicity cost weighting factors of temozolomide and cytotoxic-T-cell, acting on the tumour cell population compartment, producing the cost JT which is to be optimized. For such optimization problems, it is known that the important characteristic to be considered is the ratio r T1 : r T2 . Thus, we can take the parameter r T1 to have a normalized value of unity (i.e. r T1 = 1), thereby the task is to suitably choose or optimize the value of the other tuning parameter r T2 . Correspondingly, r L1 and r L2 are respectively the toxicity cost weighting factors of interleukin-2 and tumour-infiltrating lymphocytes, which act on the cytotoxic T-cell compartment and produces the toxicity cost JL. Similarly, this cost can be minimized by normalizing r L1 = 1, and then optimizing r L1 . All the tuning parameter values must be greater than or equal to zero. Using the upper and lower bounds that needs to be followed by the cellular and pharmacological variables (Table 2), we can calculate the numerical values of the therapeutic weight parameters (Additional file 2: item B.3 and Table 1 there). The dosage parameters of all three drugs remain positive throughout the time duration: If so, all are given. Two drugs become negative or imaginary: here the remaining drug with a positive drug dosage rate is administered. All the three drugs violate the positivity condition: then no drug is given, until one or more drug rates become positive at a subsequent time, upon which the administration of the drug/s is resumed. If case (ii) is applicable, then there will be three different combinations for two drugs at a time by permutation: (a) temozolomide and interleukin, or (ii) temozolomide and tumour infiltrating lymphocytes, or (iii) interleukin and tumour infiltrating lymphocytes. If case (iii) is relevant, then the three possibilities are: temozolomide or interleukin or tumour infiltrating lymphocytes. The mathematical formulation for cases (ii) and (iii) are derived later (Additional file 2: item B.4), using the overall approach of case (i) presented above. Further, once the tumour cell count becomes zero (point P, Figure 2B) by any of the above approaches, one stops the drug/s thereafter. The overall methodology of our approach is shown in Figure 5. Flow sheet of multimodal therapy to actuate full elimination of tumour cells. We computationally model the tumour system dynamics using custom-made coding and solve in the MATLAB platform [eq. (7)-(14A)], and thereby obtain the temporal profile of the varying dose-rate of the therapeutic agents, by solving eq. (37)-(39) which respectively furnish the temporal profile of temozolomide, interleukin-2 and tumour-infiltrating lymphocytes, which would eliminate the tumour cell population. In Figure 6 we develop the detailed procedural steps into a readily-usable algorithm toolkit. Our concern is the general problem of neurooncology, especially neuroectoderm originating tumours such as glioma, melanoma or neuroblastoma, which are comparable tumours, biologically and pharmacologically, and respond to similar therapeutic interventions, as temozolomide, interleukin-2 and lymphocyte immunotherapy by T-cells [1, 5, 20, 32, 33]. Now we apply the proposed approach to regressing both slowly and rapidly growing tumours, astrocytoma grade II and astocytoma grade III respectively, aiming at a time-frame of about 2 months. We take the values of parameters of the equations from experimental clinical studies available or from general oncological investigations (Table 1). The values of the parameters can be applied to tumours in general, for example to tumours of neuroepithelial origin, as melanoma or neuroma, or sarcoma [9, 19, 24]. Actually, using values of such parameters from clinical or pre-clinical tumour model systems, one can solve differential equations of tumour response under drugs or immune cells, and the mathematical predictions are closely confirmed and validated by cytological measurements on human subjects during therapy [19, 34, 35]. Steps of Multimodal Therapy Algorithm for Tumour Elimination. We consider the realistic case of low-grade tumour as ologidendroglioma or glioma grade II tumour with initial conditions of starting malignant cell population (T 0 ) of 2 × 107, natural killer cell population of 105, cytotoxic T-cell population of 5 × 104 and circulating lymphocytes of 109 cells (see endnote b before the References). From this T 0 value, we get a bias shift T* = 1.8986 × 105 cells [right-side of eq. (4)] (see subsection on “Determining tumour regression rate constants” above). 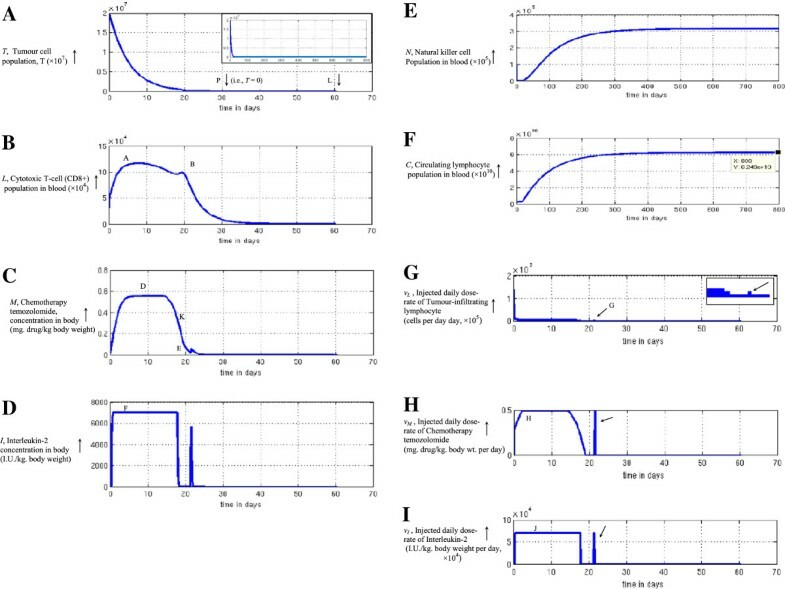 All the other constants used in the model are given in Table 1, with the tumour cell growth rate, a = 0.301 per day, and the deceleration rate of logistic tumour growth b = 1.01x10-8. We start the simulation procedure increasing the temporal step by one minute each time (Figure 7), and find that the tumour cell population actually become zero for extinction at 30.1 days (Figure 7A). One may notice that in this case the tumour cells are eliminated before the desired time duration, t p . This duration is different from the initially planned tumour elimination time t p , since, during simulation there may be time durations when a drug is stopped [this happens if its dose is calculated to have a negative or imaginary value [Figure 6, item (M)]], but the other drugs are increased with sufficient intensity to ensure tumour cell lysis at a substantial level. These increased therapeutic dosages can have nonlinear cell-killing effects and thus produce a shorter tumour elimination time than expected. It may be noted that we perform the computation for a time span of 20 times the extinction period (i.e. span of 800 days), a sufficiently long time to check permanency of regression. The regression appears to be lasting without any re-appearance of tumour cells, even though the therapy had been stopped much earlier (Figure 7A). It may be noted that for our plots or records, we take the computed cellular population values to have the next integer numeral, e.g. if N, C, T or T* is calculated out to be 1230.23 cells, the value is taken to be 1231 cells. Induction of complete elimination of low-grade tumour under multimodal therapy, inversely reconstructed with bias shift: oligodendroglioma tumour. 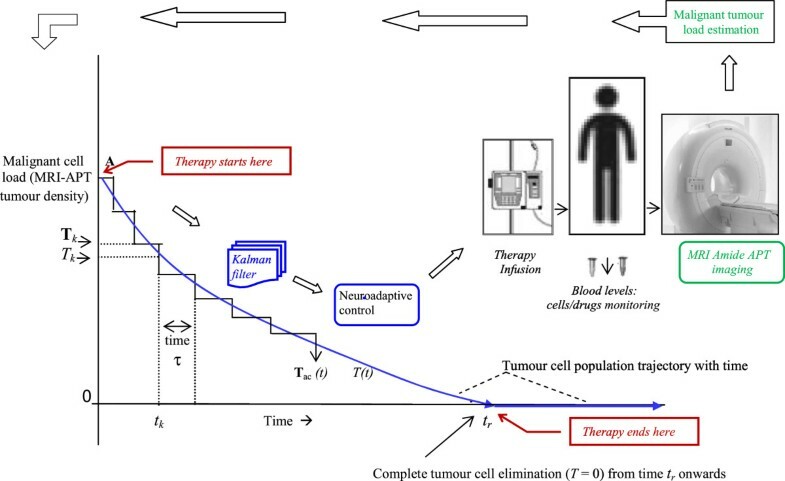 (A) Tumour cell population as therapy progresses, population becomes zero at point P, after 30.1 days, system tracked for 70 days (point L), to ensure complete elimination of the cells and no relapse of them occurs. Inset shows plot for 800 days, tumour cells population remains zero indefinitely. (B) Temporal variation of the Cytotoxic CD8+ lymphocyte population needed for complete elimination of tumour. Note bimodal temporal dose-profile with two peaks, occurring at two time points, A and B. (C) Temporal profile of concentration of chemotherapy agent Temozolomide required to eliminate the tumour. Observe unimodal temporal dose-profile with hump D, thereafter drug level decreases to E; (D) Level of Interleukin-2 concentration needed for tumour regression. Note the substantial level of interleukin, the level being truncated so as to keep concentration level below its toxicity threshold (point F level). (E) Natural killer cell population during therapy. Population stops increasing duly, 600 days plotted to show this and population does not cross upper bound of physiological limits in Table 2. (F) Circulating lymphocyte population, also does not exceed upper bound of physiological limits (Table 2). (G) Injected daily dose-rate of tumour-infiltrating lymphocyte required for tumour elimination. Arrow demarcates pulse dosage injection (point G) needed at latter portion of the therapy. Distinct step G readily seen in enlarged inset (arrow). (H) Injected daily dose-rate of Temozolomide chemotherapeutic drug necessary for tumour regression, dose-rate does not rise above H, so as to be below toxicity bound (Table 2). Arrow points to pulse dosage injection required later. (I) Injected daily dose-rate of Interleukin-2 required for eliminating the tumour, dose-rate also kept at permissible upper limit (Table 2). Arrow shows elevated pulse dosage injection needed later. We also plot the blood concentrations of the cytotoxic T-cells, chemotherapeutic agent temozolomide and interleukin-2, required to eliminate the tumour (Figure 7B-7D). Also displayed are plots of the population of circulating lymphocytes and NK cells to check that there is no significant toxicity as side-effects of the therapy (Figure 7E-7F). We also observe that these values are also well within the corresponding bounds of the human host system (Table 2). Finally Figure 7G-7I show the injected dose rates, as required, day-wise, for each of the three therapeutic agents, that enables full tumour elimination. The circulating lymphocytes and NK cells takes around 500 days to reach the steady state values of 76 billion and 510,000 cells respectively. Note that these values closely corroborate with the stationary points solved theoretically earlier, which are 72 billion and 430,000 cells respectively [see eq. (6A) and subheading “Stationary condition of the system” there]. We find that the extreme values of these variables in the graphs are well within the bounds of the human host system (Table 2). For instance, the maximal dose-rate of temozolomide chemotherapy and of tumour-infiltrating lymphocytes are less than 10% and less than 1% respectively, of the upper bound of these agents in Table 2. Further, the cumulative dose of the interleukin (from the dose-rate graph calculated as area under the curve in Figure 7D), is below 1% of the interleukin upper bound in Table 2. Induction of complete elimination of low-grade tumour under multimodal therapy, inversely reconstructed with bias shift: astrocytoma III. (A) Tumour cell population as therapy progresses, the population becomes zero at point P, after 40.11 days, the system is tracked for 800 days in the inset figure, to confirm the full extinction of tumour cells without any relapse over a period of 800 days. (B) The temporal variation of the Cytotoxic CD8+ lymphocyte population needed for full regression of tumour. One discerns the bimodal temporal dose-profile with two peaks at A and B. (C) The temporal profile of Temozolomide concentration necessary for tumour elimination. There is evidently an unimodal temporal dose-profile with the hump D, thence the chemotherapy level diminishes to point E; (D) The level of Interleukin-2 concentration required for extinction of the tumour cells. One notes the substantial level of interleukin (F), with truncation so as to have the level below the toxicity limit of interleukin in Table 2. (E) Natural killer cell population, N that does not cross the upper bound of physiological limits (Table 2). (F) Circulating lymphocyte population, C that can also be maintained below the upper bound of physiological limits (Table 2). (G) Injected daily dose-rate of Tumour-infiltrating Lymphocyte which is necessary for tumour elimination. An elevated pulse dosage injection essential at the latter part of the therapy, is delineated by arrow. (H) Injected daily dose-rate of Temozolomide chemotherapy that is requisite for the tumour regression. The pulse dosage injection required at the latter duration of the therapy, is shown by an arrow. (I) Injected daily dose-rate of Interleukin-2 that is needed for the extinction of tumour cells. An arrow shows the pulse dosage injection (point G) needed at the terminal portion of the therapy. the dosages of the three agents are approximately the same fraction of the upper bound (10%, 1% and 1%). We also discern that the therapy period is considerably longer in high-grade tumour, basically since the tumour growth rate is about 50% more than the slow-growing tumour (value of parameter α, in Table 1). Further, since these therapeutic dosages are a much smaller fraction of the upper bounds, the dosage profile can be well tolerated by patients. Actually, the overall patterns of the graphs (Figures 7 and 8) are comparable, across both the high and low grade tumours. The values of the parameters used are taken from Table 1. However these biological system parameters can vary across individuals, depending on the physiological and constitutional of the patient. Hence we need to check that the methodology is applicable even though the parameters may vary along a range. In order to test the versatility and robustness of our approach, we varied the initial immunological status (values of N, C, L cells) and tumour system parameters (values of tumour growth rate, α and carrying capacity, β). We performed 500 random simulations to check for complete tumour elimination, in both tumour grades. We found that tumour extinction for oligodendroglioma occurred in 100% cases if the variation was 0%, and in 98% of the cases as the coefficient of variation was increased to 10% (Table 4). For astrocytoma, the results are comparable. It has been known that the physiological parameters are generally kept constant homeostatically by organisms, with a 10% variation around the mean level . Thus we can ascertain that the proposed approach may be able to induce tumour elimination in the large majority of cases. If one compares the corresponding graphs in Figures 7 and 8, there are evident similarities in the temporal profiles of the therapeutic agents needed in both high-grade and low-grade tumours to enable elimination of malignancy. The common patterns valid across both tumours are elucidated below. One notes that (i) no injections of any of the three therapeutic agents are required any time after the time point of extinction of tumour, which does not recur later (Figure 7G-7I and Figure 8G-8I); (ii) the blood levels of the three therapeutic agents and the populations of the natural killer cells and circulating lymphocyte stay within the requisite limits, assuring that there would be no significant toxicity to the patient (Figure 7B-7F and Figure 8B-8F). One can make two pertinent observations from the simulation results. Firstly, for one to make the exponential decay curve of tumour cell population hit the T = 0 baseline (i.e. the x-axis of Figure 2B) at a definitive time point t p , one needs to inject a terminal pulse of each of three therapeutic dosages before the end of treatment protocol in both the low-grade and high-grade tumours, as shown by arrows in the six graphs in Figure 7G-7I and Figure 8G-8I. The conjoint effect of the pulses of all three agents ensure that in the last stage, all the tumour cells in the exponential extremity of cell population decay curve, do become eliminated. Secondly, the persistence of the cytotoxic T lymphocytes in blood for a over a week after tumour has been eliminated (Figures 7B and 8B), can have a beneficial effect, such that it can act as a vigilant anti-tumour measure against recurrence, by acting for an appreciable time after tumour extinction. After that duration elapses, this lymphocyte population tapers off. The curve of M is unimodal for both low-grade and high-grade tumours, steadily rising initially, and later, gradually tapering off (Figures 7C and 8C). This chemotherapy concentration curve follows the usual pharmaco-kinetic curve of a customary drug administration: a unimodal hump, with gradually rising drug concentration to point D, and, later gradual concentration reduction (Figure 9A shows overall pattern). The common pattern template of required activation functions of input factors associated with complete tumour regression. (A) Unimodal intensity of chemotherapy (temozolomide). (B) Bimodal intensity of leucocyte immunotherapy (cytotoxic lymphocyte). (C) Uniform truncated intensity of cytokine immunotherapy (interleukin-2). (D) Saturating intensity of the tissue protective entities: natural killer cells and circulating lymphocytes. This graph has bimodal peaks for both the high-grade and low-grade tumour (Figures 7B and 8B, arrows; Figure 9B). We observe that for tumour elimination, there is a need to have a peak of CTL, both, around the initial and the final phases of the therapy. The initial peak concentration in required to forcefully target and guide the trajectory of the cancer cell population curve (T) towards the zero baseline (Figures 7A and 8A). The final peak concentration of CTL, occurs before the time of tumour elimination, and is necessary to sufficiently eliminate the tumour cells and depress their population trajectory so that the same hits the zero baseline at the definitive selected time point P (Figure 1B). Depending on the tumour system dynamics, the height or activation-level of the second peak may be lower (Figure 7B), or higher (Figure 8B), than the height or activation-level of first peak. In case of Cytotoxic T-cell concentration, the first peak is due to therapeutic agents of tumour-infiltrating lymphocytes and interleukin, whose dosing starts as an impulse stimulus from the initial time. The impulse of these agents also enhance the generation of CTL population. The second peak in cytotoxic T-cells (point B in Figure 8B) occurs due to the later dip or decay of chemotherapy concentration along the hump of the M curve (point K in Figure 8C). The chemotherapeutic agent is toxic to and diminishes all the cellular constituents, including CTLs, and, hence, a decrease of chemotherapy induces a rise of CTL then. This same pattern of primary and secondary induction of T-cell population also occurs in the other tumour (Figure 7B-7C). This agent is needed at a substantially high level (at the upper bound, just below toxicity level), so as to induce a higher level of immune activation that would enable complete elimination of glioma cells (Figures 7D, 8D and 9C). Indeed it is well known from clinical experience in neurooncological immunotherapy that interleukin-2 administered at significantly augmented dose, induces long-lasting immunomodulation to act against those malignant cells that bypass usual therapeutic intervention . Actually, the graph for the high- and low-grade tumours has rapidly rising high amplitude, as the interleukin-2 level is truncated and kept stationary within toxicity limit. This population initially increases and then plateaus in both tumours (Figures 7F, 8F and 9D), to approach the saturation level of the long-term steady state as mentioned earlier. Similar to the Circulating lymphocytes, the NK cells show saturation behaviour for both high and low grade tumours (Figures 7E, 8E and 9D). Increasing the tumour cell lysis by anti-tumour lymphocytes, which are activated by cytokine modulation (for instance tumour infiltrating lymphocytes, interleukin-2 etc.). 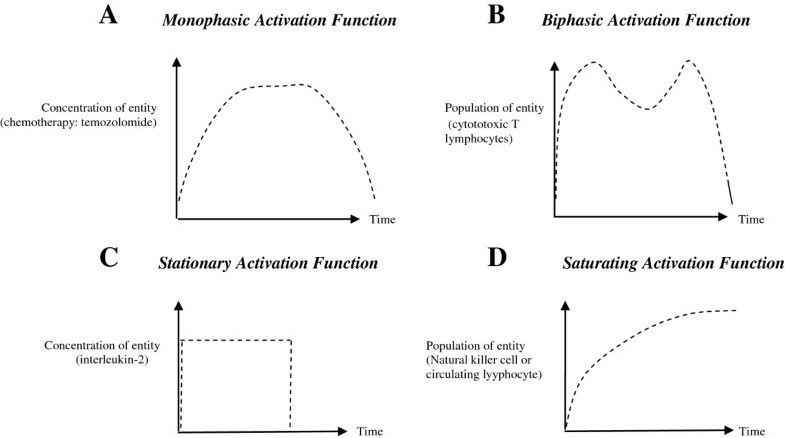 Further, the model developed shows that to induce tumour regression, the three antitumour entities should have three distinct temporal profiles: (1) biphasic intensity for lymphocyte activation, (2) monophasic intensity for activation of chemomodulative DNA damage (chemical alkylation), (3) stationary intensity of cytokine activation (interleukin-2). The experimental studies in animals [37–39] and clinical situation [40, 41] corroborate these findings. Thus our results show that complete elimination of tumour can be attained by (i) the five-pattern profile: activation of antitumour lymphocyte (bimodality), chemomodulative DNA damage (unimodality), interleukin (stationary), natural killer cell (saturation), and circulating lymphocyte (saturation), (ii) the two kinetic conditions: bias shift and exponential decrementing dynamics [the tumour trajectory formula of eq. (4)]. There are two aspects where the approach could be improved. Firstly, one can increase the system robustness, which diminishes as the individual patient-specific fluctuations increases (see earlier subsection on Robustness). 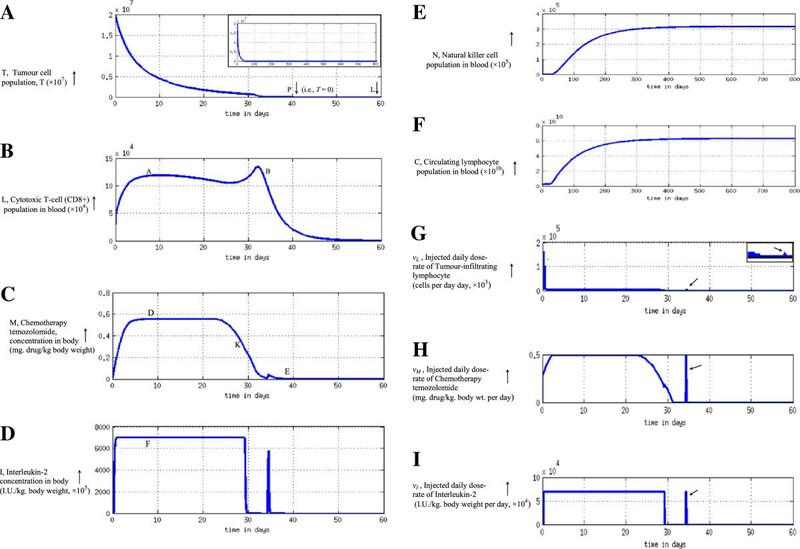 For real-time implementation, we can use the neuro-adaptive controller, which can reliably follow the desired mathematical trajectory of the tumour cell population curve (Figure 2B), and can be well adapted to different values and fluctuations of biological parameters of different patients. We have used such a controller in devising imatinib chemotherapy dosing in chronic myeloid leukaemia , and 100% robustness was obtained even when the maximal tumour density varied from 150,000 to 400,000 cells/mm3, indicating about 250% variation on the baseline level. Secondly, for proper monitoring of a patient, the declining tumour load T can be weekly or semiweekly estimated non-invasively, by MRI amide-proton transfer imaging, which maps the cell proliferation intensity by amide mobility . This emerging technology holds high potential, as this method is an efficient one to distinguish between various oncological conditions such as tumour recurrence, tumour haemorrhage or tumour necrosis. In Figure 7A the tumour cell diminution trajectory is shown for the subject in question, the cell population being mathematically derived given the physiological parameters. It would be preferable if one could check this mathematically obtained curve T(t) with the actual real-life tumour cell population T (t) as the treatment process goes over months, the actual population T (t) being estimated radiologically at suitable discrete time intervals of τ (Figure 10). The aim is to have correction-making feedback so that the actual realistic curve T tracks and follows the desired computationally-optimized curve T. In case if there is a discrepancy at a particular time point t k , between the actually-measured value and the mathematically-predicted value (i.e. 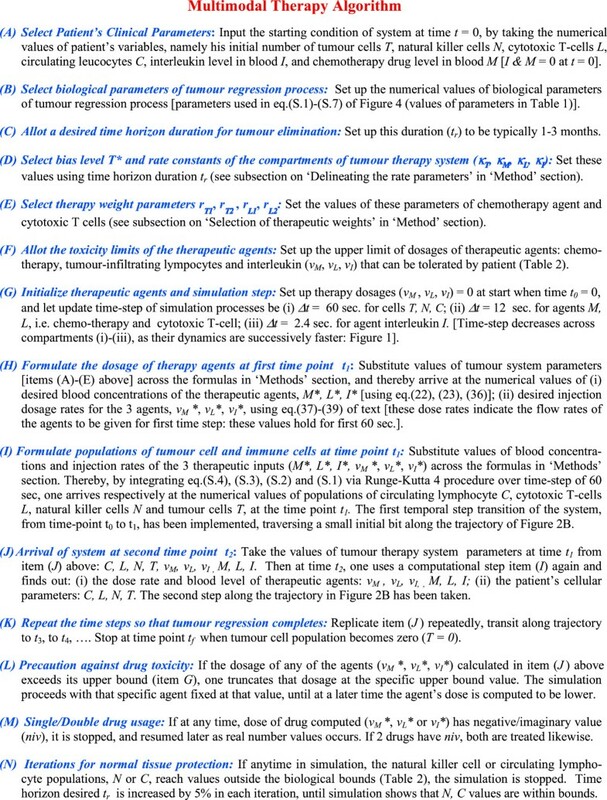 between T and T at time point t k ), then the value at that moment of the actual number of tumour cells T k can be used as the input value of tumour cell population at time point t k in the simulation procedure for going to the next time point t k+1 as per the procedure in Figure 6. Thereby, the new dosages of the drugs can be calculated for reaching the same target, namely zero population of tumour cells. 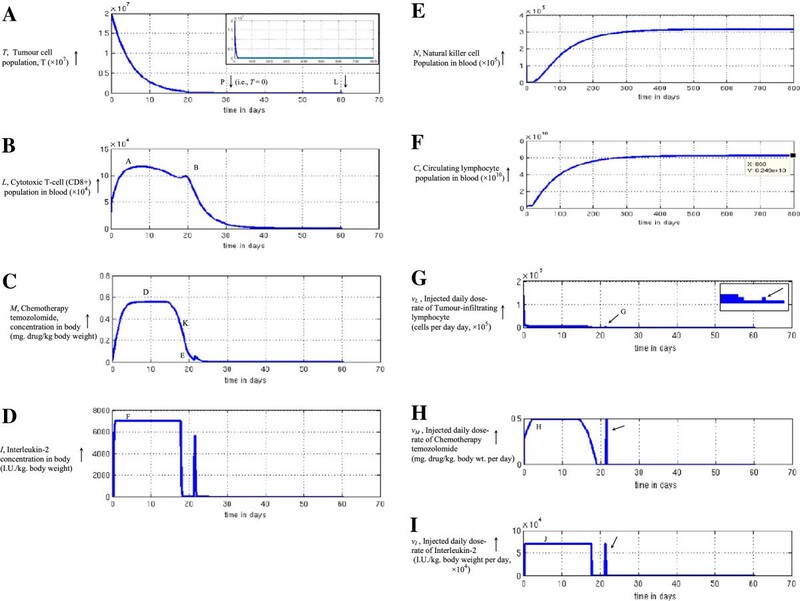 The result is that the actual trajectory of the diminution of the tumour cell population becomes a discrete approximation of the continuous mathematical curve, with the time interval τ (Figure 10). Nevertheless, the final target of zero tumour cell population is attained. Clinical implementation of tumour elimination procedure, using MRI-based tumour-load monitoring method at weekly time intervals. The multimodal therapy starts from point A and its effect on the malignant tissue is monitored by estimating the tumour load (correlate of tumour variable T) using MRI amide proton-transfer imaging, done at time intervals of τ. The blood levels of the therapeutic agents and of its cell populations (circulating lymphocytes, natural killer cells, cytotoxic T-cells etc.) are also measured then. These data are used to give corrective feedback to the therapy system in case there is incongruity between the actual trajectory and the mathematically calculated trajectory desired. Data sampling at τ and any uncertainty or instability of the biological parameters, are taken care by Kalman’s filtering and neuroadaptive control which actuates the infusion pump of the therapeutic inputs to the patient. For monitoring while the therapy is in progress, one need to have at suitable time intervals, the overall measurements of the serum temozolomide and interleukin-2 levels, as well as the populations of cytotoxic T-cells, natural killer cells and circulating lymphocyte in the blood (Figure 10). Only approximate values of these parameters or of the tumour cell population are required, as even large variations of these parameters can be accommodated by the neuro-adaptive controller mentioned above. During practical implementation, it may not be possible to measure all the biological parameters, neither a parameter can be estimated at all the desired time points as there may be discontinuous or missed sessions. Here, one can use suitable quantitative procedures as the Kalman’s technique or constraint filter method which has been used in immunology to estimate the likely values of biological parameters at the discrete or missed sessions, given their measured values in other sessions [43, 44]. Thus, it would suffice to monitor the tumour parameters weekly or twice-weekly, to enable the therapy control system tracking and adapting function, as demarcated in Figure 10. One may observe that during therapy (Figures 7E-7F and 8E-8F), the circulating lymphocytes and natural killer cells increase but there is no hazard, as the populations are within the upper physiological limits of Table 2. Moreover, for making the methodology more suited to personalized medicine so that we can pre-select the most sensitive drugs beforehand, we can utilize the emerging method of tumour-graft technology whereby one can grow a therapeutically faithful model of the individual patient’s tumour biopsy tissue on experimental mice . Tumour graft platforms can test different drug combinations, and pre-select the most sensitive drug before starting the treatment, the accuracy of selecting effective drug molecule being 86%. Lymphocytic (CTL) immunomodulation can be of tactical utility, as it exhibits a range of unique behaviors , that chemotherapeutic drugs cannot, such as (i) the cells can migrate to the antigen-bearing primary or secondary growths of tumour, even in hidden tissue depths, (ii) CTLs can continue to multiply automatically in response to immunogenic proteins of malignant cells, until all those cells become extinct. We have formulated the distinctive dose-time relationship of chemotherapy and of immunotherapy (interleukin-2 and cytotoxic lymphocyte), such that their orchestrated functioning, that incorporates a biphasic temporal profile for T-cell, ensures that all the tumour cells are eliminated within a desired time. Excess toxicity to the host is avoided, as the circulating lymphocyte and natural killer cells in blood are protected. The approach is patient-specific as the formulation depends on the tumour load, the levels of cytotoxic T lymphocytes, cytokine interleukin, natural killer cells and circulating lymphocytes. All these parameters vary with the individual patients, and hence the different therapeutic dose-time profile obtained for each specific patient will be optimally suited from her. The formulation put forward use of an innovative approach of bias shift, control systems analysis, performance cost minimization and inverse construction of drug input. The limitation of the proposed model is that we have not considered the effect of tumour cells resistant to the chemotherapy drug and also not taken care of angiogenesis process where the drug permeability to the tumour cells will hinder. A broad-based gamut of findings from animal experimentation and clinical investigations are shown to corroborate with the tumour extinction approach developed. An unanticipated but noteworthy finding is the importance of giving a terminal pulse of the therapeutic agents before the end of the therapy, so that all the tumour cells become extinct and there is no extra drug-induced toxicity, the natural killer cells and circulating lymphocytes being within the physiological limits. This is in contrast to the generally prevailing view in clinical medicine, which advocates tapering off of the therapy in the later stages. This tapering may cause tumour recurrence in clinical praxis, as there is no intensive spike of the therapeutic agents to eradicate all the malignant cells. To summarize, information from temporal dynamics of both the endogenous and exogenous tumour regression has been used to explore the mechanism and elucidation of integrative functioning of various therapeutic modalities, whose combined effect eliminates the malignant tumour as corroborated with experimental findings. The method proposed can be of wide-ranging application, and can be adapted for application to conditions where there is involvement of chemotherapy and/or immunotherapy. The procedure delineated is also applicable to other tumour systems, as it offers a principled approach to tumour containment and thus an incisive prospect for probing towards further biological and clinical situations. a Clarifications on upper/lower limits of biological and therapeutic parameters (Table 2 ). Circulating lymphocyte population: The normal blood volume under active circulation is 3.5-4.5 litres. The higher limit of lymphocytes in individuals can be up to 100 × 109 cells/litre . Taking the upper bound of the blood volume, this translates to the higher bound of lymphocyte in a person to be 4.5 × 1011 cells. In contrast, the lowest lymphocyte count for patients for duration of 6–12 months across therapy can be 663–1160 cells/μl . Taking the lesser value of the cell count and the lower level of blood volume, we get minimal bound of lymphocytes as 2.32 × 109 cells, which the patient can tolerate up to 6 months. Natural Killer Cells population: The upper limit of NK cell is 13% of lymphocyte population, with CD56/CD16 surface protein being the marker for these lymphocytes . As the higher bound of lymphocyte population in the earlier paragraph is 4.5 × 1011 cells, we have the maximum value of NK cell population in the individual to be 5.85 × 1010 cells. On the other hand, the lower limit of NK cells (CD56/CD16 lymphocytes) is 0, occurring in people having natural killer cell deficiency condition , and a period of 3½ months have been noted for elapse of this condition, before considerable infection can set in . Hence we also mention this time duration for the NK cells lower bound. Tumour-specific Cytotoxic (CD8+) T-cell population: The upper limit of this cell population for a patient is 20150 cells/mm3. Using a blood volume of 4.5 litres, the total T-cell (CD8) population will be 6.05 × 1010 cells. Furthermore, tumour-specific cytotoxic T-cells, that are specifically active against a particular malignant lesion, has been known to come into play if the tumour is present, and to decay away if the tumour undergoes elimination . Hence, one mentions the lower bound of these T cells to be 0. Temozolomide chemotherapy infusion dosage rate: Maximum daily dosage  of temozolomide is 200 mg/m2/day, i.e., 4.45 mg/kg body. wt. per day. One may choose not to give it, so the lower limit is 0. Interleukin-2 immunotherapy infusion dosage rate: Maximum infusion given is 7.2 × 104 International Units (I.U.)/kg/day . The lower bound can be set to nil, as above. Tumour-infiltrating lymphocytes (TIL) immunotherapy cumulative dosage: The maximum cumulative dose for a patient over the whole duration of therapy is 13.7 × 1010 cells . Likewise, the lower limit is zero. b Determination of initial number of the cells for numerical experimentation. Tumour cells: The number of cells in a tumour which becomes clinically detectable is 108 occupying a volume of 1 cm3, out of these 107 cells are malignant, while the rest are stromal cells . For our quantitative experimentation, we take double the amount of tumour cells to have a safety factor of 2, thus giving 2 × 108 malignant cells as our initial condition. Circulating lymphocytes: We also note the range of normal values: leucocyte count = 4000 to 11000/mm3, the fraction of lymphocytes are 15-40%, and actively pulsating blood volume under circulation is 3.5-4.5 litres. To be cautious for ensuring tumour regression, we will consider the lower values in the range. By multiplying the requisite aforesaid values, we have the circulating lymphocyte population in the person as 2.1 × 109 cells. Again to be on safer side, we take half of the population for our study (i.e. 1.05 × 109 cells, say 109 cells). Natural killer cells: The fraction of NK cells is 1-13% of circulating lymphocytes , we take the lower value for calculation, and use the circulating lymphocyte value of 1 × 109 cells given above. Further, there is available data on the antitumour effector factor of NK cells during study of endogenous tumour regression, namely 1:50 as target tumour cell: effector NK cell ratio, i.e. a value of 2% . Multiplying these values, we get the effective population of tumour-targeted NK cells as 2 × 105 cells. As earlier, we will consider half this value to be on the safe side, i.e. NK cell population = 105 cells. Cytotoxic T-cells: The fraction of cytotoxic CD8+ T-cells is 1-3% of circulating lymphocytes . The cytotoxicity factor of activated tumour-infiltrating cytotoxic T cells (CTL) is 9.5% as regression process is underway . One also knows that if the tumour is invasive and spreads, the fatigue factor come into force, which can cause the CTL efficiency (as estimated by cytokine production) to decrease to 12.2% of the level as compared to when there is no invasion of tumour . Using these factors, we arrive at the effective population of cytotoxic T cells as 1.15 × 105 cells, say 105 cells. As per the lower end, we have taken half, i.e. 5 × 104 cells as the CTL population. Suhela Kapoor, VP Subramanyam Rallabandi contributed equally to this work. The research was supported by core funds from National Brain Research Centre, Ministry of Science & Technology, Govt. of India. SK, VPSR and CS are respectively supported by funding received from educational grant of Dept. of Biotechnology, Dept. of Information Technology, and Ministry of Human Resource Development, Government of India. The research was conceived, designed and planned by PR and RP. The modelling and numerical experiments were performed and the biological studies investigated by SK, VPSR, CK, RP and PR. All authors examined and evaluated the data. SK, VPSR and PR wrote the manuscript, with participation from CS and RP. All authors read and approved the final manuscript.